If you haven’t already, NOW is the time to plan your law school visits! We’ve already posted about Illinois law school visits here, but what about law schools outside of Illinois? Here is a roundup of Open House days or visit opportunities at law schools located outside of Illinois that are popular with Illini. Tours, classes, and appointments with an admissions counselor on most weekdays between 8 and 5; if you want to visit a class, however, we recommend avoiding Fridays because few classes are available. Prospective Student Information Session–Nov. 21, 9:15-11:30 am. Click here to register. Individual tours and class observations can be scheduled here. Individual tours and class visits are available Monday through Friday, 8:30 a.m. to 4:30 p.m. Eastern. Click here to view schedule and register. BU Law Open House–Saturday, December 1, 9:15-11:00 am. Student-led tours and class visits offered through Nov. 14. Contact the school to arrange visits after that date. Tours are offered on Mondays, Wednesdays, and Fridays, and class visits are available by appointment. Click here to schedule. November is a busy time in the pre-law world! Scroll down for info on law school admissions webinars by Harvard, NYU and Yale, a PAID internship opportunity, Pre-Law 101, law school open houses, the Udall Scholarship Program and more! Pre-Law 101 – Tuesday, November 13, 4-5pm, 514 IUB. This is the final Pre-Law 101 of the semester. This workshop is designed for incoming students who are new to pre-law or are interested in learning more about it. We will cover: What it means to be pre-law at Illinois, course selection, majors, and extracurriculars, building a pre-law resume, and what law schools are really looking for. We will outline a four year plan to maximize your undergraduate experiences in order to make a great law school candidate. We’ll also take any questions about law school and legal careers. Incoming students should attend a Pre-Law 101 prior to setting up an individual pre-law advising appointment. Registration will be open until November 12 or until the session is full. Go here to register. 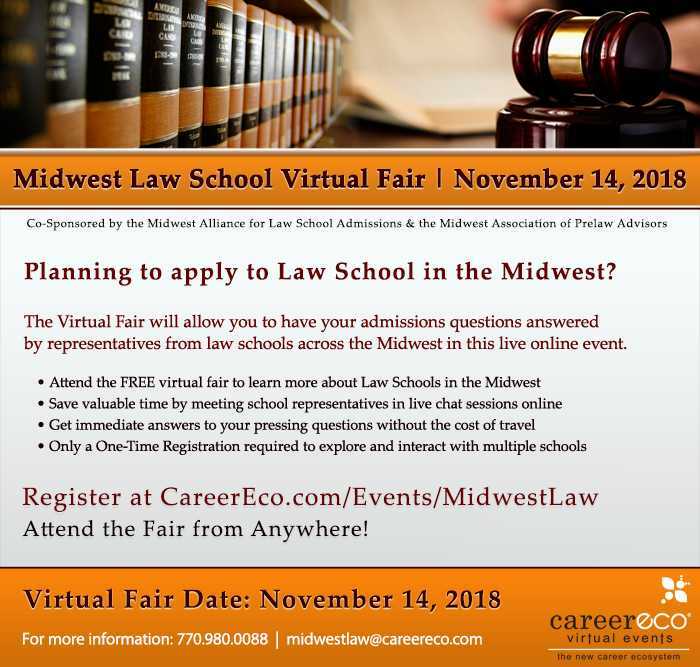 Free Midwest VIRTUAL Law Fair Wednesday, November 14! Were you unable to attend our Law School Fair? Over 25 Midwest law schools will be available to chat online with you about the admissions process, their schools, scholarships, journals, etc. This event is FREE and participants don’t need to travel! Click here for more information and to register. Law School Admissions Events: Note that several are over FALL BREAK! Law School Open Houses–Some fall law school open house opportunities have already passed. Make sure you check the websites of your selected schools for these very helpful events! Chicago-Kent: Their Fall Open Houses have now passed, but you can still arrange for an individual tour, admission info session, and sit in on a class. Click here for more details. DePaul University: Their Fall Open Houses have now passed, but you can still arrange for an individual tour, admission info session, and sit in on a class. Click here for more details. John Marshall: JMLS hosted their final Fall 2018 Open House already. For information on scheduling a campus visit, click here. Loyola-Chicago: Information Sessions: Monday, November 19 (Note: That’s during Fall Break!) at 11:15 am; or Friday, November 30 at 12:15 pm. Click here for more details. Are you interested in an unpaid internship but are concerned about the financial hardship it may cause? The Fred S. Bailey Internship Scholarship Program for Cause-Driven Leaders is available to undergraduate students at the University of Illinois who receive an unpaid internship with a public service agency or not-for profit organization. Awards are $1,000 for a part-time internship or $2,500 for a full-time internship and are given directly to the student to help with educational expenses. Spring 2019 (For internships that occur between January 1, 2019 – May 15, 2019) Application Deadline: November 13. Click here to apply. Coming soon: The Pre-Law Internship newsletter will be posted before winter break over on our Compass page! November LSAT Takers: Top 5 Things to Do! The November LSAT is less than 2 weeks away! Here is a list of tips and reminders for those of you gearing up for the test and working on your law school applications. Finish any addenda or optional essays! Check your Credential Assembly Service (CAS) account and make sure your letters of recommendation and transcripts are all in! Finish each of your law school applications so that the only thing left to do once your LSAT score is posted is to hit submit! Remember: this is a rolling admissions process, so the earlier you complete and submit your applications, the better!